I love candles and would have them burning all the time, except that kids and dogs make them a little less than safe. 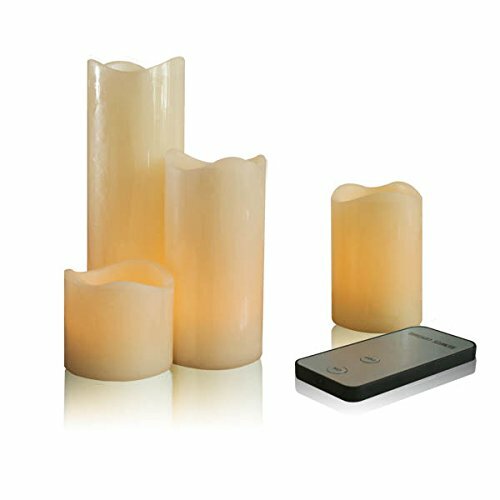 This LED Ivory Pillar Candle with Remote might be just the solution! It uses real wax but no flame. Instead, it is battery operated, but looks like a real flame. I have major problems with imitation scents, so most candles won’t work for me at all. These don’t bother me; they are a natural look and feel, but without the flame and smoke. They add the candlelight atmosphere in a safe and practical way. The remote control makes them even more convenient. This set is perfect for home use, but would make a nice arrangement for a small party, too. I will be giving some as gifts this year, too!